This is a really great way of cooking chicken drumsticks to liven them up. This in my mind is perfect summer fare. 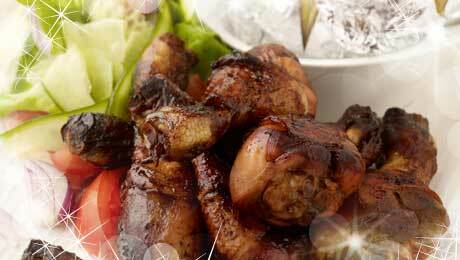 Place the chicken drumsticks into a large bowl and drizzle with the honey, soy sauce, lime juice and chilli powder. Mix well ensuring they are fully coated. Place the drumsticks into a baking dish with the marinade, cover tightly with tin foil and place in the preheated oven. Cook for 45-50 minutes in this manner and then remove the tin foil and continue cooking for a further 15-20 minutes. Pierce 4 large potatoes with a skewer and then wrap tightly in tin foil. Place in the oven (as above) for 1 hour. Neatly arrange the lettuce, tomato, red onion and cucumber onto a large serving platter. Drizzle with olive oil and serve immediately with the drumsticks and baked potatoes.